~ Monsters University has Problem Solving. Ages 4-7 years. Kids gaming software is intended for kids 4 to 7 years of age; compatible with all VTech InnoTab systems including InnoTab 3, 3S and 3S Plus. New Vtech Disney Pixar MONSTERS UNIVERSITY Learning App for INNOTAB. Trending at C $6.40eBay determines this price through a machine-learned model of the product's sale prices within the last 90 days. VTECH INNOTAB. WORKS WITH ALL INNOTAB SYSTEMS! DISNEY PIXAR MONSTERS UNIVERSITY. For all Innotab systems except InnoTab® MAX. For all Innotab systems except InnoTab MAX. Disney Pixar Monsters University. Mike and the other Oozma Kappas need to win, or Mike and Sulley will get expelled! Vtech InnoTab: Disney Pixar Monsters University 4 - 7 Years Pre K - 1st. Mike and the other Ozxma Kappas need to win, or Mike and Sulley will get expelled! Beginning Letters: (Find the missing letter to help Mike search for the flag). 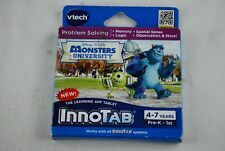 VTech InnoTab Software, Disney Pixar's Monsters University. Trending at C $7.96eBay determines this price through a machine-learned model of the product's sale prices within the last 90 days. Works with MobiGo and Mobigo 2 Touch Learning System. Disney Pixar Monsters University. This is for one NEW sealed item. Mike and the other Oozma Kappas need to win, or Mike and Sulley will get expelled! Vtech InnoTab Disney Pixar Monsters University Game Cartridge (80231900). Condition is Used. Shipped with USPS First Class Package. 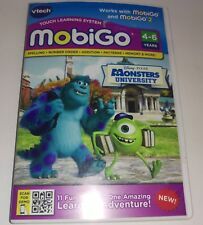 VTech MobiGo Software Monsters University learning system will provide hours of fun and learning. Mike and the other Oozma Kappas need to win or Mike will get expelled. It is designed for ages 4 to 6 years and will provide endless hours of learning fun. Works with MobiGo and MobiGo 2 Touch Learning Systems. Mike and the other Oozma Kappas need to win, or Mike will get expelled! Works with all InnoTab systems. For pre-K - 1st (4-7 years). Works with MobiGo and MobiGo 2. For Kids 4-6 Years of Age. Works with MobiGo and MobiGo 2. Works with all InnoTab systems. Compatible with all VTech MobiGo systems. Open Box - Certified by The-Open-Box. The item may show signs of use which may include markings, scuffs or light scratches. Includes all essential accessories for the item to function. Compatible with all VTech MobiGo systems. It's a learning adventure with loads of scary fun!